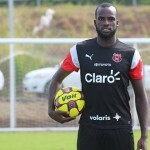 Soca Warriors forward Jamille Boatswain made a scoring return to the Pro League yesterday for Defence Force but it was not enough for the Army/Coast Guard combination, as they fell 3-2 to Police FC in a double header at the Ato Boldon Stadium in Couva. 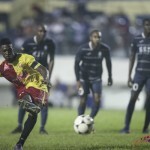 Boatswain burst on the international circuit last year with the Trinidad and Tobago National Senior Team, which led to a professional contract in Costa Rica and then Honduras. Neither move lasted six months. Photo: Defence Force striker Jamille Boatswain (centre) prepares to steer his hattrick goal past Police FC goalkeeper Adrian Foncette (right) during the Pro Bowl semifinals at the Ato Boldon Stadium on 12 February 2017. However he made an immediate impact for third place Defence Force yesterday, albeit in a losing effort. It was the third straight win for Police, as they moved from bottom of the 10 team standings to sixth place. 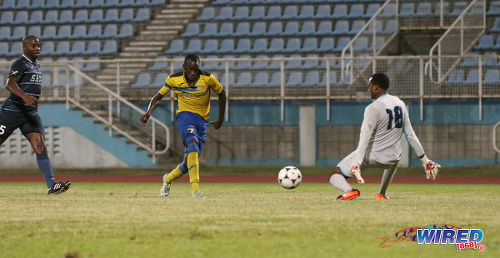 Free scoring midfielder Kareem Freitas scored twice for the Lawmen to increase his season’s tally to six goals—just one shy of the Pro League’s leading marksman, W Connection forward Marcus Joseph. Veteran Defence Force poacher Devorn Jorsling also got on the score sheet with his third goal of the season. In the curtain raiser of the double header, Morvant Caledonia United followed up on their midweek draw with W Connection with a 3-0 win over Terminex St Ann’s Rangers. 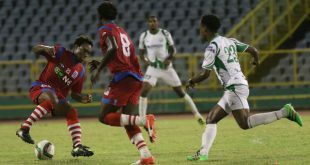 Former Central FC defender Keion Goodridge opened the scoring for the “Eastern Stallions”, who are in eighth place with five points from five games this season. Rangers, who have not scored in their last two outings, are seventh with six points from six games. 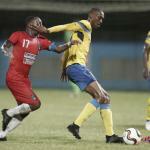 St Ann’s Rangers 0, Morvant Caledonia Utd 3 (Keion Goodridge 18, Joshua Alexander 51, Saydrel Lewis 64) at Ato Boldon Stadium. Defence Force 2 (Devorn Jorsling 48, Jamille Boatswain 87), Police FC 3 (Shakuile Williams 2, Kareem Freitas 53, 71) at Hasely Crawford Stadium.